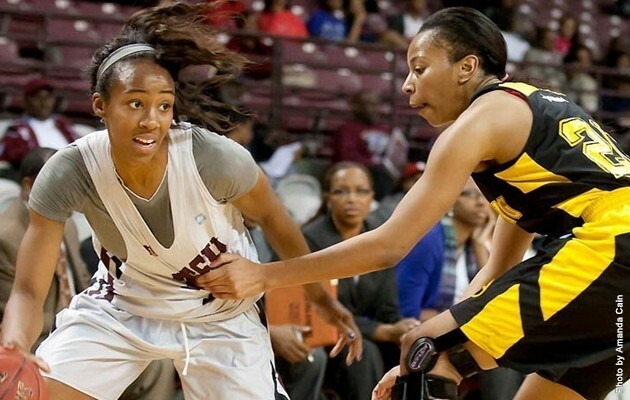 MONTGOMERY, AL – The Texas Southern women’s basketball team pushed their winning streak to 15 consecutive games with a 64-52 road victory on Monday night. With the victory TSU concluded the regular season an impressive 8-1 on the road in conference play. Texas Southern (18-9, 15-1 SWAC) scored 14 of the game’s first 15 points and put Alabama State in a deficit they could not overcome. The Lady Hornets (9-20, 7-9) at one point cut the margin to two points, but never led in the game. After the team’s traded baskets to open the second half, Alabama State went on a 9-0 run to cut the Texas Southern lead to 31-29 at the 13:31 mark on a three-point basket. It remained a two-possession game for most of the next six minutes. However, after a three-point play by Texas Southern’s Morgan Simmons with less than eight minutes to play in the game gave the Lady Tigers a 41-33 advantage, Alabama State could get no closer than seven points the rest of the way. Gianne Fleming led all Texas Southern scorers with 15 points and three rebounds. Brianna Sidney and Kayla West contributed 12 points each while Te’era Williams tallied 8 points. Texas Southern outscored Alabama State inside the paint 22-16. Texas Southern will host the Southern Jaguars at the H&PE Arena on Thursday, February 28 at 5:30 pm. TSU will host its home finale on Saturday, March 2 against Alcorn State. Tip-off time for that contest is also slated for 5:30 pm. Saturday will also be Senior Night for the Lady Tigers basketball program. Head coach Cynthia Cooper Dyke is now only 2 victories shy of reaching 150 wins as a head coach. The Lady Tigers have now won 15 straight games dating back to Jan. 4. Te’era Williams scored a season high 25 points against Alabama A&M.